Totally Veg! 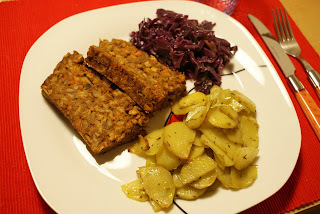 : Es wird scho glei dumpa... and Lentil Loaf! With red cabbage and rosemary potatos - mhmmm! The loaf is a really big portion just for the two us, but I had it in a sandwich today, with vegan mayonnaise, ketchup and some pickels, and I'm looking forward to eating more of these delicous sandwiches. 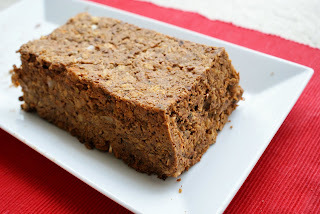 So, go and make Tofu Mom's lentil loaf, I definitely recommend it! That's it for today. I'm eating roasted chestnuts right now... mhm. Gotta love Christmas time! Oh how exciting! I'm glad it turned out! It looks beautiful!! Thanks for the mention! !